A new landmark for Derbyshire. The Boardwalk is the perfect place for a day out or a relaxing few hours. 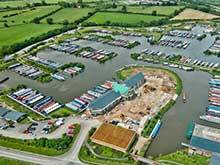 Providing first-class facilities and services for boaters, lodge owners and visitors. The luxury open plan design of our lodges cannot fail to result in relaxing lazy days spent looking out onto beautiful scenery.